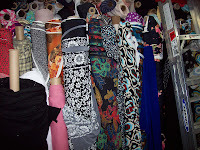 Some fashion sewists have good luck at this small store located on the ninth floor of an office building on W. 37th in the Garment District. Large selection of print jerseys. Not open on the weekends. Hours: Monday - Friday 9 a.m. - 6 p.m.; Saturday 10 a.m. - 5 p.m. 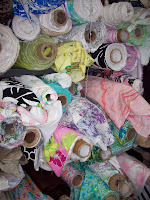 I have been to the temple of knit fabrics and it is called Spandex House. Don't let the name put you off: There's definitely enough spandex fabric here to inspire Will Ferrell's next 20 movie roles. But there's also a long (and very narrow) aisle filled with nothing but bolts of lovely cotton lycras in every shade and weight under the sun. 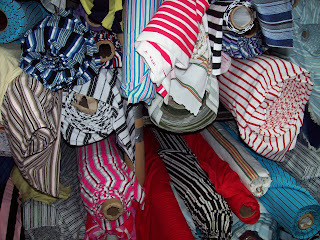 And this stuff is top quality—the same fabrics you'd find in better RTW t-shirts and casualwear. Even better are the wonderfully low prices. Many of the bolts are 72" wide, so you get a lot for your cut. I promise that you will never be able to buy knits from your local chain-store fabric place after you've been to Spandex House in NYC. The only downside I can see to Spandex House is that they don't sell cotton lycra prints, just solids and stripes. I hear there are stores in the garment district that sell knits at prices even lower than Spandex House's, but because I'm usually on such a tight schedule I tend to stick with tried-and-true stores. 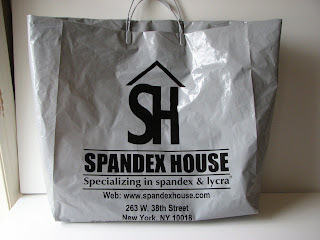 Spandex House is one of my TNT stores and I recommend you check it out when you visit the garment center. 5/18/09: Spandex House has expanded on the first floor, taking over an empty store next door. 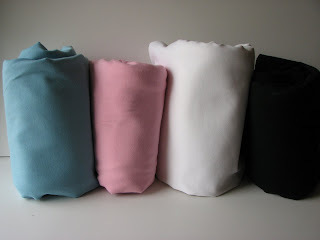 Now it's much easier to find the lovely poly knit prints that are usually hiding behind all that shiny spandex.